Upon Arrival: Online ticket holders should report directly to the attraction entrance. If you have any changes to your online purchase, please report to the box office. PRINT YOUR TICKETS: We recommend having a printer ready to print your tickets OR a smartphone capable of receiving an SMS and displaying .pdf files. We can scan barcodes directly from your phone. PLEASE DOUBLE CHECK THE EMAIL ADDRESS USED WHEN CHECKING OUT, your tickets will be sent to that email address. We recommend not using an iCloud.com email, as those users have problems receiving our ticket emails. No refunds or exchanges for unused tickets. Tickets are not redeemable for any other shows. An insurance option is available for purchase. Note: Purchasing the insurance is the only method to get a refund on unused tickets. 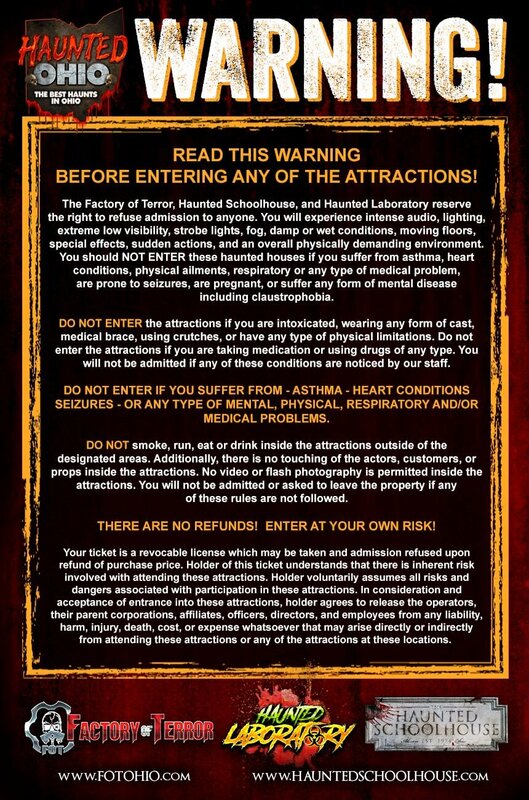 Attractions are not recommended for persons under the age of 12. Ticketing fees apply. THANK YOU for supporting our locally owned and operated haunted attraction. Season pass grants unlimited entry into all attractions at two locations: 1. The World Famous Factory of Terror and 2. The Legendary Haunted Schoolhouse and Haunted Laboratory. The 2019 Season pass includes FASTPASS entry to all events including glow stick and special off-season events. Enter as many times as you want. The 2019 season pass comes with up to 4 "buddy" passes per night where you may purchase tickets for your guest at the box office for 50% off. Free parking pass included. Expires December 31, 2019.